Walk Into 2019 And Get Paid Everyday! It’s New Year’s Eve and Streamate is kicking off the new year with another contest. It’s gonna be a final bash to bring in 2019 with a grand prize of $2019!The two day cammodel contest begins on Dec. 31st to Jan. 1st GMT. Once the contest comes to an end in the New Year, the top 200 performers from the Streamate platform will be rewarded. 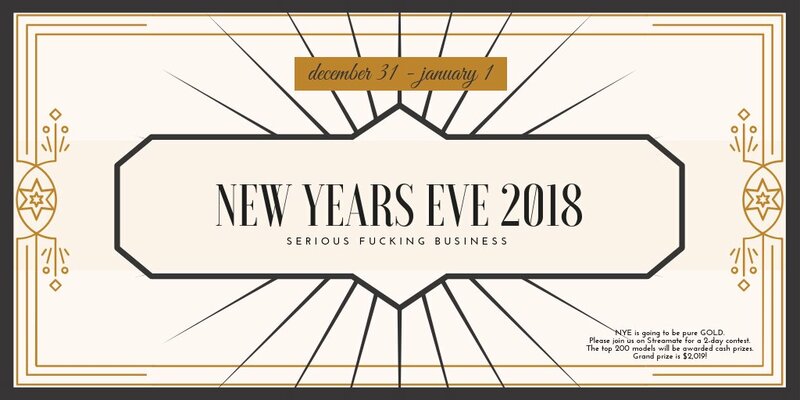 End 2018 with a bang! Please join us for the final contest of the year! All webcam performers are eligible to earn rewards during the contest and are encouraged to reach out to all of their regulars to announce the even. Letting your customers know about the two day contest can help improve your cammodel ranking. Where a model falls on the leader board is determined by the amount of money members spend on them during the event. There are a few exclusions that do not factor into your rankings during the New Years extravaganza: Video Sales, your Cammodels affiliate earnings, adjustments for TopSpot camshows, partner sites, and Gold Club earnings. After the event, Streamate will verify all rankings for legitimate performers. Streamate is our #1 program on BoleynModels, and for good reason. Many cammodels have made a decent career on Streamate and don’t want to risk transferring to daily pay with BoleynModels for fear they will “lose” placement. For more information please visit this article.